Marriage*: He married Elizabeth Frances ('Eliza') Burleson on 29 June 1876. "Death of Mr. J. C. Easterlin [sic]. "Mr. J. C. Easterling, old and respected citizen of the Chatfield community, died at his home at that place last Saturday and was laid to rest in Old Cade Cemetery Sunday afternoon, under the auspices of the Masonic Lodge, and Bro. J. F. Stanley of the Baptist Church of this place preaching the funeral ceremony. "Mr. Easterling was born in Simpson county, Miss., but for many years had been a respected citizen of this state, where his family grew to maturity. He was a Christian gentleman, an example of good citizenship, and his kindly presence will be sadly missed by all. [S1207] Corsicana Daily Sun, Corsicana, Tex., online archive at http://corsicana.newspaperarchive.com, 29 Sep 1919, p. 10, col. 4 (obituary of J. C. Easterling, Sr.). [S1207] Corsicana Daily Sun, Corsicana, Tex., online archive, above, 29 Sep 1919, p. 10, col. 4 (reprinted here with consent of the Corsicana Daily Sun). [S81] Mrs. J. H. Montfort, "Peter T. Montfort," in Navarro County History, vol. 2 (Corsicana, Tex. : The Navarro County Hist. Soc'y, 1978), p. 211, (naming John C. Easterling as her father). Marriage*: She married John C. Easterling Sr. on 29 June 1876. Other Names*: Elizabeth Burleson, Eliza Burleson, Eliza Easterling, Elizabeth Frances Burleson Easterling, Elizabeth Burleson Easterling, Elizabeth Frances Easterling, Elizabeth Easterling. "Mrs. Elizabeth Frances Easterling, 92, died at the home of a daughter, Mrs. R. E. Montfort, 1511 Elmwood, Saturday morning. "Funeral services will be held from the McCammon Chapel at 2 p.m. Sunday. Burial will be in the Cade cemetery near Streetman. "The rites will be conducted by Rev. W. M. Shamburger, pastor of the First Baptist church. "Born May 11, 1859, in Freestone county, Mrs. Easterling made her home on the Easterling ranch at Chatfield for 50 years. "Surviving are three sons, Earl, Ban and John Easterling, all of Chatfield; two daughters, Mrs. Montfort, Corsicana, and Mrs. R. L. Henderson, Waco; four brothers, D. D. Burleson, Streetman; Oliver Burleson, Wortham; John and Joe Burleson, both of Fort Worth; a sister, Mrs. F. E. Baker, Stamps, Ark; a number of grandchildren, great-grandchildren and other relatives. [S1207] Corsicana Daily Sun, Corsicana, Tex., online archive at http://corsicana.newspaperarchive.com, 23 Feb 1952, p. 1, col. 6 (obituary of Elizabeth Frances Easterling). [S1207] Corsicana Daily Sun, Corsicana, Tex., online archive, above, 23 Feb 1952, p. 1, col. 6 (reprinted here with consent of the Corsicana Daily Sun, with obvious typographical errors corrected). [S81] Mrs. J. H. Montfort, "Peter T. Montfort," in Navarro County History, vol. 2 (Corsicana, Tex. : The Navarro County Hist. Soc'y, 1978), p. 211, (naming Elizabeth Frances Burleson as her mother). John Harris Montfort during World War II. Graveside services for John Harris Montfort of Corsicana will be held at 11 a.m. today, August 6, at the New Chatfield Cemetery with Rev. Marion M. Harris of Jefferson and Marshall officiating. Mr. Montfort died Monday, August 4, in Marshall after a lengthy illness. Mr. Montfort was born in Navarro County on December 3, 1907, the son of Robert Earl Montfort and Bertha Easterling Montfort. He graduated from Corsicana High School in 1925 and Texas A&M College in 1929. Mr. Montfort married Katherine Finch in 1935, and she preceded him in death in 1937. Mr. Montfort and Lois Edith Davis were married for 51 years and she preceded him in death in 1992. Mr. Montfort served in the Army Air Corps during World War II at Foster Field in Victoria and Randolph Field in San Antonio. He retired from the Air Corps with the rank of Colonel. After the war, Mr. Montfort returned to Navarro County to farm and ranch near Chatfield. He was active in the First United Methodist Church, Masonic Lodge No. 174, and the Texas A&M University Association of Former Students. Mr. Montfort is survived by [a daughter, a grandson, a granddaughter, a brother and a sister-in-law, sisters-in-law, and a number of nieces, nephews, and cousins]. Mr. Montfort was preceded in death by his son-in-law, Dr. William Quintin Burns of Marshall and his brother, Robert Earl Montfort of Corsicana. • A summary of his military service, from The Men and Women in World War II from Navarro County, Texas, p. 334, is here. [S81] Mrs. J. H. Montfort, "Peter T. Montfort," in Navarro County History, vol. 2 (Corsicana, Tex. : The Navarro County Hist. Soc'y, 1978), p. 211, (naming Robert Early Montfort as his father). [S8] Corsicana Daily Sun, Corsicana, Tex., 1 Aug 1997 (obituary of John Harris Montfort) (naming Robert Early Montfort as his father). [S8] Corsicana Daily Sun, Corsicana, Tex., 1 Aug 1997 (obituary of John Harris Montfort) (naming Bertha Easterling as his mother). [S8] Corsicana Daily Sun, Corsicana, Tex., 1 Aug 1997 (obituary of John Harris Montfort). [S81] Mrs. J. H. Montfort, "Peter T. Montfort," above. [S8] Corsicana Daily Sun, Corsicana, Tex., 1 Aug 1997, reprinted here with consent of the Corsicana Daily Sun. Theo Thorp Montfort, reprinted here with consent of the Corsicana Daily Sun, Corsicana, Tex. 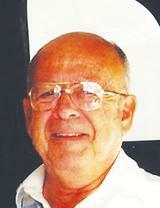 Obituary*: "Theo Thorp Montfort, 89, of Corsicana passed away Sunday, Oct. 30, 2011 at Navarro Regional Hospital. He was born July 26, 1922 in Chatfield to Robert Earl and Bertha Easterling Montfort. "He graduated from Corsicana High School and was attending Texas A & M University in College Station. He chose patriotism instead of education; he enlisted in the United States Air Force on Pearl Harbor Day. He was seriously wounded soon after joining the service. He was in the hospital for over year and then returned home to Texas to spend the rest of his life as a rancher. 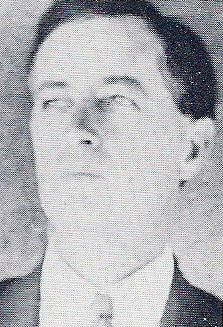 "Mr. Montfort was preceded in death by his parents; Robert E. and Bertha Montfort; brothers, John Harris Montfort and wife Lois and Robert Earl Montfort, Jr.
"He is survived by his wife of 61 years, Helen Montfort, [a daughter and son-in-law, a granddaughter, a sister-in-law, another sister-in-law and her husband, and numerous nieces and nephews]. "Visitation will be held from 1 to 2 p.m. Wednesday, Nov. 2, 2011 in The Jackson Parlor at First United Methodist Church in Corsicana. "The funeral service will immediately follow the visitation at First United Methodist Church Sanctuary at 2 p.m. Wednesday, Nov. 2, 2011. Interment will be at Oakwood Cemetery. "Pallbearers will be Terry Montfort, Ben Nelson, William LeNoir, Will Burns, and Maurice English. Honorary pallbearers will be Don Marrett, Phil Weideman, Dr. John Harper, and Dr. J.D. Carroll. "The family wishes to express their deepest appreciation for the love and care given by his special friend and helper and Dr. Kent Rogers. Memorials may be made to the First United Methodist Church at 320 N. 15th St. Corsicana, TX 75110; St. Jude’s Hospital at 501 St. Jude Place, Memphis, TN 38105, or the charity of your choice. "An online guestbook is available at www.corleyfuneralhome.com by selecting the Theo Thorp Montfort obituary. [S585] Corsicana Daily Sun, Corsicana, Tex., online at http://www.corsicanadailysun.com viewed on 3 Nov 2011 (obituary of Theo Thorp Montfort) (naming Robert Earl Montfort as his father). [S585] Corsicana Daily Sun, Corsicana, Tex., online at http://www.corsicanadailysun.com viewed on 3 Nov 2011 (obituary of Theo Thorp Montfort) (naming Bertha Easterling as his mother). [S585] Corsicana Daily Sun, Corsicana, Tex., online at http://www.corsicanadailysun.com viewed on 3 Nov 2011 (obituary of Theo Thorp Montfort). [S1231] The Men and Women of World War II from Navarro County, Texas, online, http://www.txgenweb6.org/txnavarro/war/world_war_ii/… p. 334 (not giving the date). [S585] Corsicana Daily Sun, Corsicana, Tex., online at http://www.corsicanadailysun.com viewed on 3 Nov 2011 (reprinted here with consent of the Corsicana Daily Sun). [S1231] The Men and Women of World War II from Navarro County, Texas, online, above p. 334. [S796] Navarro County Cemetery Records, vol. 7 (Corsicana, Tex. : The Navarro County Gen. Soc'y, 1987), New Chatfield Cemetery survey, p. 5. [S81] Mrs. J. H. Montfort, "Peter T. Montfort," above, (giving the date but not the place). [S796] Navarro County Cemetery Records, vol. 7, above, New Chatfield Cemetery survey, p. 5 (giving the date but not the place). [S67] The Dallas Morning News, Dallas, Tex., 8 Jun 1937, sec. II, p. 11 (obituary of Mrs. J. H. Montfort). [S8] Corsicana Daily Sun, Corsicana, Tex., 1 Aug 1997 (obituary of John Harris Montfort) (stating that she died in 1937 without giving the place or the day and month). Helen Statham Montfort, reprinted here with consent of the Corsicana Daily Sun, Corsicana, Tex. 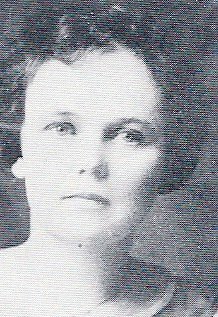 Picture of Helen Statham Montfort accompanying her obituary on Navarro County, Texas Genealogical and Historical Web Site. Copied on 6/28/15. Wife of Theo Thorp Montfort; daughter of Milton H. Statham & Hilda Marie (Harris) Statham. [S585] Corsicana Daily Sun, Corsicana, Tex., online at http://www.corsicanadailysun.com 24 Mar 2015, viewed on 28 Jun 2015 (obituary of Helen Marie Montfort). [S585] Corsicana Daily Sun, Corsicana, Tex., online at http://www.corsicanadailysun.com 24 Mar 2015, viewed on 28 Jun 2015 (reprinted here with consent of the Corsicana Daily Sun). Marriage*: She married Martin Donaldson. Marriage*: He married Francis Edmundson, daughter of Burwell Edmundson and Jane Tabitha Heys. • His Find A Grave memorial, which includes pictues of his grave marker, is here. [S440] Navarro County Cemetery Records, vol. 4 (Corsicana, Tex. : The Navarro County Gen. Soc'y, 1985), p. 89 (naming B. Edmundson as his father). [S961] Find A Grave, online at http://www.findagrave.com, memorial for Charles W. Edmundson, memorial no. 33223790, viewed on 12 Feb 2012 (naming Burwell Edmundson as his father). [S961] Find A Grave, online, above, memorial for Charles W. Edmundson, memorial no. 33223790, viewed on 12 Feb 2012. • His Find A Grave memorial, including a picture of his grave marker, is here. [S961] Find A Grave, online at http://www.findagrave.com, memorial for Jessee L. Edmundson, memorial no. 33223803, viewed on 12 Feb 2012 (naming Burwell Edmundson as his father). [S179] Rice Cemetery Association Directory (n.p. : n.pub., 1985) (spelling his name as Jessee). This publication includes a map showing the locations of the five sections of the cemetery. The pages are not numbered. A copy is in the possession of Roger Bartlett, Austin, Tex. [S440] Navarro County Cemetery Records, vol. 4, above, p. 89 (spelling his name as Jessee). [S961] Find A Grave, online, above, memorial for Jessee L. Edmundson, memorial no. 33223803, viewed on 12 Feb 2012. Marriage*: She married Sam Long. Marriage*: He married Edith Mae Edmundson, daughter of Burwell Edmundson and Jane Tabitha Heys. William Ernest Edmundson, from Navarro County History, vol. 2, p. 387. Note*: He was born about four and a half miles west of Rice and attended school in Oak Grove (in nearby Ellis County) until the family moved to Rice in 1894. He lived near San Angelo and Arden, Texas in 1901-02 and then worked in a Rice bank. After they married he left the bank and they lived on a farm a mile and a half west of Rice. [S83] R. B. Edmundson, "Rufus Burwell Edmundson," in Navarro County History, vol. 2 (Corsicana, Tex. : The Navarro County Hist. Soc'y, 1978), p. 387. [S84] R. B. Edmundson, "William Ernest Edmundson," in Navarro County History, vol. 2 (Corsicana, Tex. : The Navarro County Hist. Soc'y, 1978), p. 387. [S961] Find A Grave, online at http://www.findagrave.com, memorial for William Ernest Edmundson, memorial no. 33223713, viewed on 12 Feb 2012. [S961] Find A Grave, online, above, memorial for Nerie Agnes Edmundson, memorial no. 33223727, viewed on 12 Feb 2012 (not giving the date). [S961] Find A Grave, online, above, memorial for William Ernest Edmundson, memorial no. 33223713, viewed on 12 Feb 2012 (not giving the date). [S440] Navarro County Cemetery Records, vol. 4, above, p. 89 (common marker with Nerie Agness Edmundson). [S961] Find A Grave, online, above, memorial for William Ernest Edmundson, memorial no. 33223713, viewed on 12 Feb 2012 (naming William Ernest Edmundson as his father). [S961] Find A Grave, online, above, memorial for William Ernest Edmundson [Jr.], memorial no. 33223657, viewed on 12 Feb 2012 (naming William Ernest Edmundson as his father). Nerie Agnes Langham Edmundson, from Navarro County History, vol. 2, p. 387. 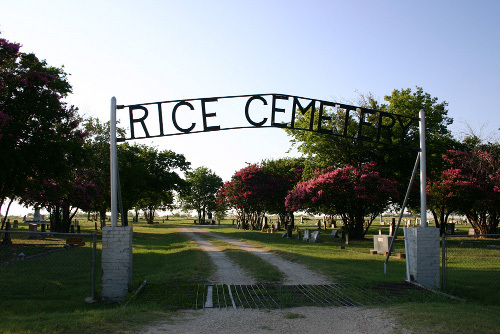 [S179] Rice Cemetery Association Directory (n.p. : n.pub., 1985) (spelling her name as Merie). This publication includes a map showing the locations of the five sections of the cemetery. The pages are not numbered. A copy is in the possession of Roger Bartlett, Austin, Tex. [S961] Find A Grave, online at http://www.findagrave.com, memorial for Nerie Agnes Edmundson, memorial no. 33223727, viewed on 12 Feb 2012. [S458] Funeral card, Mrs. W. E. Edmundson, prepared by McCammon Memorial Chapel, Corsicana, Tex. [S179] Rice Cemetery Association Directory, above (spelling her name as Merie and not giving the date). [S440] Navarro County Cemetery Records, vol. 4, above, p. 89 (not giving the date). [S961] Find A Grave, online, above, memorial for Nerie Agnes Edmundson, memorial no. 33223727, viewed on 12 Feb 2012 (naming Nerie Agnes Edmundson as his mother). [S961] Find A Grave, online, above, memorial for William Ernest Edmundson [Jr.], memorial no. 33223657, viewed on 12 Feb 2012 (naming Nerie Agnes Edmundson as his mother). [S83] R. B. Edmundson, "Rufus Burwell Edmundson," above, (naming the county but not the town). [S588] Obituary of Rufus Burwell Edmundson, online http://www.rootsweb.com/~txnavarr/obituaries/pg90004.htm, viewed on 30 Apr 2005 (citing Abilene [TEX.] Reporter, 9 Jan 1999). [S1108] Social Security Death Index, online at http://tinyurl.com/RootswebSSDI, viewed 14 Jan 2007 (giving the date but not the place). [S961] Find A Grave, online at http://www.findagrave.com, memorial for Rufus Burwell Edmundson, memorial no. 25339457, viewed on 10 Feb 2013 (giving the date and the county). [S588] Obituary of Rufus Burwell Edmundson, above, (stating that they married in 1936 without naming the place). [S83] R. B. Edmundson, "Rufus Burwell Edmundson," above, (stating that they married in 1936 without naming the place). [S585] Corsicana Daily Sun, Corsicana, Tex., online at http://www.corsicanadailysun.com viewed on 6 Nov 2007 (obituary of Mary Nancy Edmundson). [S1108] Social Security Death Index, online at http://tinyurl.com/RootswebSSDI, viewed 14 Jan 2007 (stating that he died on 6 Jan 1999; not naming the place of death but stating that he lived in Denton, Tex. when he died). [S585] Corsicana Daily Sun, Corsicana, Tex., online at http://www.corsicanadailysun.com viewed on 6 Nov 2007 (obituary of Mary Nancy Edmundson) (giving the date but not the place). [S961] Find A Grave, online, above, memorial for Rufus Burwell Edmundson, memorial no. 25339457, viewed on 10 Feb 2013 (not giving the date). [S961] Find A Grave, online at http://www.findagrave.com, memorial for William Ernest Edmundson, memorial no. 33223713, viewed on 12 Feb 2012 (naming William Ernest Edmundson as his father). [S961] Find A Grave, online, above, memorial for William Ernest Edmundson [Jr.], memorial no. 33223657, viewed on 12 Feb 2012. Other Names*: Mary Swafford, Mary Nancy Swafford Edmundson, Mary Nancy Edmundson, Mary Swafford Edmundson, Mary Edmundson. Obituary*: Mary Nancy Edmundson, 94, of Denton died Monday, Oct. 15, 2007, at Denton Rehabilitation and Nursing Center. Mrs. Edmundson was born Aug. 9, 1913, in Rice to Willie B. and Hattie (McCrum) Swafford. She was married to Rufus B. Edmundson on Aug. 1, 1936, in Corsicana. He died on Jan. 6, 1999. Mrs. Edmundson was a member of Gateway United Baptist Church. Survivors include [her son and his wife, a granddaughter, and three great-grandchildren]. She was preceded in death by her brothers, Frank Swafford, Joe William Swafford, Samuel Burdell Swafford, Henry McCrum Swafford and James Nelson Swafford. A funeral service will be held at 10 a.m. Friday in the chapel of Mulkey-Mason, Jack Schmitz and Son Funeral Home, 705 N. Locust St., Denton. Interment will follow at Oak Grove Cemetery in eastern Denton County. Visitation will be held from 6 to 7 p.m. today at the funeral home. [S585] Corsicana Daily Sun, Corsicana, Tex., online at http://www.corsicanadailysun.com viewed on 6 Nov 2007 (obituary of Mary Nancy Edmundson) (naming Willie B. Swafford as her father). [S585] Corsicana Daily Sun, Corsicana, Tex., online at http://www.corsicanadailysun.com viewed on 6 Nov 2007 (obituary of Mary Nancy Edmundson) (naming Hattie McCrum as her mother). [S961] Find A Grave, online at http://www.findagrave.com, memorial for Mary Nancy Edmundson, memorial no. 25340258, viewed on 10 Feb 2013 (giving the date but not the place). [S588] Obituary of Rufus Burwell Edmundson, online http://www.rootsweb.com/~txnavarr/obituaries/pg90004.htm, viewed on 30 Apr 2005 (citing Abilene [TEX.] Reporter, 9 Jan 1999), (stating that they married in 1936 without naming the place). [S83] R. B. Edmundson, "Rufus Burwell Edmundson," in Navarro County History, vol. 2 (Corsicana, Tex. : The Navarro County Hist. Soc'y, 1978), p. 387, (stating that they married in 1936 without naming the place). [S585] Corsicana Daily Sun, Corsicana, Tex., online at http://www.corsicanadailysun.com viewed on 6 Nov 2007 (obituary of Mary Nancy Edmundson) (stating that the cemetery is in eastern Denton County). [S961] Find A Grave, online, above, memorial for Mary Nancy Edmundson, memorial no. 25340258, viewed on 10 Feb 2013 (not giving the date). [S585] Corsicana Daily Sun, Corsicana, Tex., online at http://www.corsicanadailysun.com 17 Oct 2007, viewed on 6 Nov 2007 and reprinted here with consent of the Corsicana Daily Sun. [S83] R. B. Edmundson, "Rufus Burwell Edmundson," above. [S462] Judge Baxter McFarland, Holliday Family, above, (naming Mary Ann Holliday as his mother). Note*: They moved to Rice, Texas when he was thirteen days old. He farmed near Rice and was a Mason. He lost a foot in a 1942 farm accident. [S136] Phil J. Pollan,family group record sent to Roger Bartlett, 13 Mar 1996. [S961] Find A Grave, online at http://www.findagrave.com, memorial for Jess Dewey Pollan, memorial no. 93190843, viewed on 10 May 2014 (naming George Washington Pollan as his father). [S961] Find A Grave, online, above, memorial for Jess Dewey Pollan, memorial no. 93190843, viewed on 10 May 2014 (naming Mary Frances Malone as his mother). [S137] Index to Texas Delayed Probate Birth Records (Austin, Tex. : Tex. Dept. of Health, Bur. of Vital Statistics), vol. 28, p. 13958, file 382875. [S179] Rice Cemetery Association Directory (n.p. : n.pub., 1985) (giving only the year and not naming the place). This publication includes a map showing the locations of the five sections of the cemetery. The pages are not numbered. A copy is in the possession of Roger Bartlett, Austin, Tex. [S440] Navarro County Cemetery Records, vol. 4 (Corsicana, Tex. : The Navarro County Gen. Soc'y, 1985), p. 88 (giving only the year and not naming the place). [S961] Find A Grave, online, above, memorial for Jess Dewey Pollan, memorial no. 93190843, viewed on 10 May 2014. [S961] Find A Grave, online, above, memorial for Minnie Dyer Pollan, memorial no. 93190851, viewed on 10 May 2014 (not giving the date or place). [S1207] Corsicana Daily Sun, Corsicana, Tex., online archive at http://corsicana.newspaperarchive.com, 14 Jul 1960, p. 14, col. 4 (obituary of Mrs. Minnie Pollan) (identifying her as the wife of Jess Pollan of Rice but not giving the date or place of marriage). [S961] Find A Grave, online, above, memorial for Jess Dewey Pollan, memorial no. 93190843, viewed on 10 May 2014 (not giving the date or place). [S11] Index to Texas Death Records (Austin, Tex. : Tex. Dept. of Health, Bur. of Vital Statistics), typescript, 1977 (microfiche), p. 1318, file 96093-77. [S312] Social Security Death Index, online at http://tinyurl.com/AncestrySSDI, viewed on 1 Apr 1998 (stating that he died in Nov 1977; not naming the place of death but stating that he lived in Rice, Texas when he died and that last benefits were sent to an address in Corsicana, Texas). [S440] Navarro County Cemetery Records, vol. 4, above, p. 88 (common marker with Minnie Pollan). [S86] Ellie Funk, "Mr. Jess Pollan," above (naming Jess Dewey Pollan as his father). [S961] Find A Grave, online, above, memorial for G. W. Pollan, memorial no. 63240081, viewed on 23 Jul 2014 (naming Jess Dewey Pollan as his father). "Funeral services for Mrs. Minnie Pollan, 62, wife of Jess Pollan of Rice, who died in the Navarro Clinic Tuesday afternoon [July 12, 1960] following an extended illness, were held Thursday at 10 a.m. from the Haynie Memorial Methodist church in Rice. "The rites were conducted by Rev. H. O. Abbott, Jr., pastor of the church, assisted by Rev. Claude Gordon, pastor of the First Baptist church at Rice. Burial was in the Rice cemetery. "Mrs. Pollan was a native of Texas. "Surviving are her husband; mother, Mrs. J. S. Dyer, Rice; two sons, G. W. Pollan, Ferris, and Melton J. Pollan, Amarillo; five grandchildren, a brother, Jesse G. Dyer, Rice; five sisters, Mrs. Claude Starr, Mrs. Walter Schaefer and Mrs. George Otto, all of Houston; Mrs. C. C. Brodnax, Longview, and Mrs. A. M. Sims, Jr., Bristol, and a number of nieces, nephews and other relatives. "Pallbearers were J. K. Bradley, W. C. Mahaley, John Speicer, Gene Harris, Virgil Atchley and John Bowden. Note*: She was very active in the Methodist Church in Rice. [S440] Navarro County Cemetery Records, vol. 4 (Corsicana, Tex. : The Navarro County Gen. Soc'y, 1985), p. 88 (giving the year but no other information). [S961] Find A Grave, online at http://www.findagrave.com, memorial for Minnie Dyer Pollan, memorial no. 93190851, viewed on 10 May 2014. [S1207] Corsicana Daily Sun, Corsicana, Tex., online archive at http://corsicana.newspaperarchive.com, 14 Jul 1960, p. 14, col. 4 (obituary of Mrs. Minnie Pollan) (not giving the date but stating that she was a native of Texas). [S1207] Corsicana Daily Sun, Corsicana, Tex., online archive, above, 14 Jul 1960, p. 14, col. 4 (obituary of Mrs. Minnie Pollan) (identifying her as the wife of Jess Pollan of Rice but not giving the date or place of marriage). [S11] Index to Texas Death Records (Austin, Tex. : Tex. Dept. of Health, Bur. of Vital Statistics), typescript, 1960, vol. 2, p. 995, file 44086. [S1207] Corsicana Daily Sun, Corsicana, Tex., online archive, above, 14 Jul 1960, p. 14, col. 4 (obituary of Mrs. Minnie Pollan) (stating that she died in the afternoon of that date following "an extended illness"). [S440] Navarro County Cemetery Records, vol. 4, above, p. 88 (common marker with Jess Pollan) (not giving the date). [S961] Find A Grave, online, above, memorial for Minnie Dyer Pollan, memorial no. 93190851, viewed on 10 May 2014 (not giving the date). [S1207] Corsicana Daily Sun, Corsicana, Tex., online archive, above, 14 Jul 1960, p. 14, col. 4 (obituary of Mrs. Minnie Pollan). [S179] Rice Cemetery Association Directory, above (giving her name as Minnie Dyer Pollan). [S1207] Corsicana Daily Sun, Corsicana, Tex., online archive, above, 14 Jul 1960, p. 14, col. 4 (reprinted here with consent of the Corsicana Daily Sun). [S86] Ellie Funk, "Mr. Jess Pollan," above (naming Minnie Lee Dyer as his mother). [S86] Ellie Funk, "Mr. Jess Pollan," above (naming Minnie Dyer as his mother). 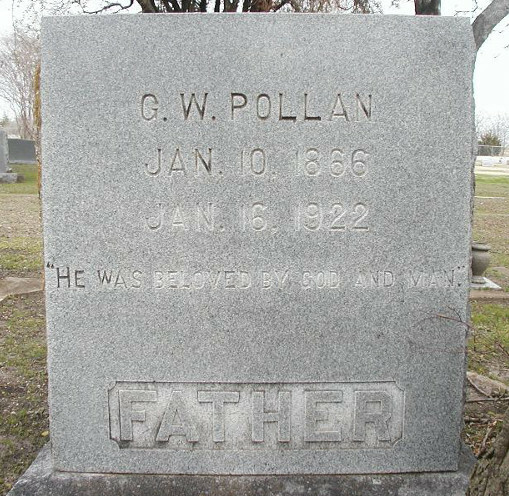 [S961] Find A Grave, online at http://www.findagrave.com, memorial for G. W. Pollan, memorial no. 63240081, viewed on 23 Jul 2014 (naming Jess Dewey Pollan as his father). [S86] Ellie Funk, "Mr. Jess Pollan," above (giving the date but not the place). [S961] Find A Grave, online, above, memorial for G. W. Pollan, memorial no. 63240081, viewed on 23 Jul 2014. [S961] Find A Grave, online, above, memorial for Irene G. Pollan, memorial no. 7276359, viewed on 23 Jul 2014. [S961] Find A Grave, online, above, memorial for Marion Irene Gipson Pollan, memorial no. 6595046, viewed on 23 Jul 2014 (not giving the date). [S961] Find A Grave, online, above, memorial for G. W. Pollan, memorial no. 63240081, viewed on 23 Jul 2014 (not giving the date). [S312] Social Security Death Index, online at http://tinyurl.com/AncestrySSDI, viewed on 1 Apr 1998 (giving his name as G. Pollan; stating that he died in Jan 1984; not naming the place of death but stating that he lived in Ferris, Texas when he died). [S312] Social Security Death Index, online at http://tinyurl.com/AncestrySSDI, viewed on 1 Apr 1998 (giving his name as G. Pollan). Other Names*: Marian Irene Gipson Pollan, Marion Gipson Pollan, Irene Pollan. • One Find A Grave memorial for her, which includes a picture of her grave marker, is here. Another Find A Grave memorial for her is here. [S86] Ellie Funk, "Mr. Jess Pollan," in Navarro County History, vol. 2 (Corsicana, Tex. : The Navarro County Hist. Soc'y, 1978), p. 390 (giving her original surname as Gibson). [S961] Find A Grave, online at http://www.findagrave.com, memorial for Irene G. Pollan, memorial no. 7276359, viewed on 23 Jul 2014. [S961] Find A Grave, online, above, memorial for Marion Irene Gipson Pollan, memorial no. 6595046, viewed on 23 Jul 2014 (not naming the city). [S961] Find A Grave, online, above, memorial for Irene G. Pollan, memorial no. 7276359, viewed on 23 Jul 2014 (giving the date but not the place). [S961] Find A Grave, online, above, memorial for Marion Irene Gipson Pollan, memorial no. 6595046, viewed on 23 Jul 2014. George Washington Pollan's grave marker, Rice Cemetery, Rice, Tex., courtesy of Jerry Herring. Note*: He was on the Rice school board's building committee for the 1912 schoolhouse. [S440] Navarro County Cemetery Records, vol. 4 (Corsicana, Tex. : The Navarro County Gen. Soc'y, 1985), p. 99 (giving the date but not the place). [S961] Find A Grave, online at http://www.findagrave.com, memorial for George Washington Pollan, memorial no. 7685312, viewed on 10 May 2014. [S961] Find A Grave, online, above, memorial for Mary Frances Malone Pollan, memorial no. 7685327, viewed on 10 May 2014. [S440] Navarro County Cemetery Records, vol. 4, above, p. 99. [S961] Find A Grave, online, above, memorial for George Washington Pollan, memorial no. 65049463, viewed on 13 Feb 2012 (naming G. W. Pollan as his father). [S961] Find A Grave, online, above, memorial for G. W. Pollan, memorial no. 7685312, viewed on 13 Feb 2012 (naming G. W. Pollan as his father). [S961] Find A Grave, online, above, memorial for Jess Dewey Pollan, memorial no. 93190843, viewed on 10 May 2014 (naming George Washington Pollan as his father). [S86] Ellie Funk, "Mr. Jess Pollan," above (naming George Washington Pollan as his father). [S1017] Navarro County, Texas Genealogical and Historical Web Site, online at http://www.rootsweb.ancestry.com/~txnavarr/index.htmhttp://tinyurl.com/p78v27u, viewed on 11 Apr 2015 (obituary of Horace Greeley Pollan) (naming George Washington Pollan as his father). [S440] Navarro County Cemetery Records, vol. 4 (Corsicana, Tex. : The Navarro County Gen. Soc'y, 1985), p. 99. [S961] Find A Grave, online at http://www.findagrave.com, memorial for Mary Frances Malone Pollan, memorial no. 7685327, viewed on 10 May 2014. [S961] Find A Grave, online, above, memorial for George Washington Pollan, memorial no. 7685312, viewed on 10 May 2014. [S961] Find A Grave, online, above, memorial for George Washington Pollan, memorial no. 65049463, viewed on 13 Feb 2012 (naming Mary F. Pollan as his mother). [S86] Ellie Funk, "Mr. Jess Pollan," above (naming Mary Frances Malone as his mother). [S1017] Navarro County, Texas Genealogical and Historical Web Site, online at http://www.rootsweb.ancestry.com/~txnavarr/index.htmhttp://tinyurl.com/p78v27u, viewed on 11 Apr 2015 (obituary of Horace Greeley Pollan) (naming Mary Frances Malone as his mother). [S440] Navarro County Cemetery Records, vol. 4 (Corsicana, Tex. : The Navarro County Gen. Soc'y, 1985), p. 100. [S961] Find A Grave, online at http://www.findagrave.com, memorial for Ella Christine Pollan, memorial no. 7685310, viewed on 13 Feb 2012. [S86] Ellie Funk, "Mr. Jess Pollan," above (stating that her parents were George Washington Pollan (1866-1922) and Mary F. Pollan (1871-1927)). Funeral services for L. M. (Lit) Pollan, 53, of Rice, who died with a heart attack Wednesday morning at his farm, were held Thursday afternoon at 3 o'clock from the Haynie Memorial Methodist church in Rice. Burial was in the Rice cemetery. The rites were conducted by Rev. Marvin C. Bledsoe, pastor of the church. Surviving are is wife, a son, three sisters, seven brothers and other relatives. Pallbearers were Capt. G. W. Pollan, Malone Pollan, Maurice Pollan, John Emmery Pollan, Lt. Milton J. Pollan and James Lee Pollan, all nephews. [S961] Find A Grave, online at http://www.findagrave.com, memorial for Litt M. Pollan, memorial no. 7685326, viewed on 13 Feb 2012. [S1207] Corsicana Daily Sun, Corsicana, Tex., online archive at http://corsicana.newspaperarchive.com, 5 Apr 1945, p. 3, cols. 1-2 (obituary of L. M. [Lit] Pollan) (not giving the date but stating that he was fifty-three years old when he died on 4 Apr 1945). [S179] Rice Cemetery Association Directory, above (giving the year but no other information). [S961] Find A Grave, online, above, memorial for Litt M. Pollan, memorial no. 7685326, viewed on 13 Feb 2012 (giving the year but no other information). [S1207] Corsicana Daily Sun, Corsicana, Tex., online archive, above, 5 Apr 1945, p. 3, cols. 1-2 (obituary of L. M. [Lit] Pollan). [S440] Navarro County Cemetery Records, vol. 4, above, p. 99 (common marker with Annie L. Pollan) (not giving the date). [S961] Find A Grave, online, above, memorial for Litt M. Pollan, memorial no. 7685326, viewed on 13 Feb 2012 (not giving the date). [S1207] Corsicana Daily Sun, Corsicana, Tex., online archive, above, 5 Apr 1945, p. 3, cols. 1-2 (reprinted here with consent of the Corsicana Daily Sun, with obvious typographical errors corrected). Death*: He died circa 1969. Burial*: Interment was in Ennis, Ellis County, Texas. [S961] Find A Grave, online at http://www.findagrave.com, memorial for George Washington Pollan, memorial no. 65049463, viewed on 13 Feb 2012 (naming G. W. Pollan as his father). [S961] Find A Grave, online, above, memorial for George Washington Pollan, memorial no. 65049463, viewed on 13 Feb 2012. Marriage*: She married Ruel Evans Bounds on 9 June 1926. Note*: She attended Rice public schools and earned bachelor's and master's degrees from North Texas State Teachers College in Denton. She taught school for more than fifty years in Rice and other Ellis County and Navarro County communities. She was superintendent of Rice High School 1946-55 and later chaired the English and Foreign Language Department of Waxahachie public schools. She and her husband were active in Haynie Memorial Methodist Church in Rice. [S137] Index to Texas Delayed Probate Birth Records (Austin, Tex. : Tex. Dept. of Health, Bur. of Vital Statistics), vol. 28, p. 13958, file 567881. [S11] Index to Texas Death Records (Austin, Tex. : Tex. Dept. of Health, Bur. of Vital Statistics), typescript, 1975, vol. 1, p. 155, file 77599. [S179] Rice Cemetery Association Directory, above (giving only the year). Note*: He was a teacher. [S961] Find A Grave, online at http://www.findagrave.com, memorial for Wm. D. Pollan, memorial no. 7686062, viewed on 13 Feb 2012. "Funeral services for Horace G. Pollan, 56, Rice Route 1, who died in the Southern Pacific Hospital in Houston Monday, were held Wednesday at 2 p. m. from the Keever Chapel in Ennis with burial in the Rice cemetery. • His Find A Grave memorial, which includes a picture of his tombstone and a list of his siblings, is here. [S1017] Navarro County, Texas Genealogical and Historical Web Site, online at http://www.rootsweb.ancestry.com/~txnavarr/index.htmhttp://tinyurl.com/p78v27u, viewed on 11 Apr 2015 (obituary of Horace Greeley Pollan) (giving his name as Horace Greeley Pollan). [S86] Ellie Funk, "Mr. Jess Pollan," in Navarro County History, vol. 2 (Corsicana, Tex. : The Navarro County Hist. Soc'y, 1978), p. 390 (naming George Washington Pollan as his father). [S1017] Navarro County, Texas Genealogical and Historical Web Site, online, above http://tinyurl.com/p78v27u, viewed on 11 Apr 2015 (obituary of Horace Greeley Pollan) (naming George Washington Pollan as his father). [S86] Ellie Funk, "Mr. Jess Pollan," above. [S1017] Navarro County, Texas Genealogical and Historical Web Site, online, above http://tinyurl.com/p78v27u, viewed on 11 Apr 2015 (obituary of Horace Greeley Pollan) (naming Mary Frances Malone as his mother). [S1207] Corsicana Daily Sun, Corsicana, Tex., online archive at http://corsicana.newspaperarchive.com, 10 Apr 1963, p. 7, col. 2 (obituary of Horace G. Pollan) (not giving the place or date but stating that he was fifty-six years old when he died on 8 Apr 1963). [S1017] Navarro County, Texas Genealogical and Historical Web Site, online, above (obituary of Horace Greeley Pollan) (not giving the date or place). [S961] Find A Grave, online at http://www.findagrave.com, memorial for Horace Greeley Pollan, memorial no. 93437619, viewed on 11 Apr 2015. [S1017] Navarro County, Texas Genealogical and Historical Web Site, online, above viewed on 11 Apr 2015 (obituary of Horace Greeley Pollan) (not giving the date or place). [S1207] Corsicana Daily Sun, Corsicana, Tex., online archive, above, 10 Apr 1963, p. 7, col. 2 (obituary of Horace G. Pollan). [S1017] Navarro County, Texas Genealogical and Historical Web Site, online, above (obituary of Horace Greeley Pollan). [S86] Ellie Funk, "Mr. Jess Pollan," above (giving his name as Horris Pollan). [S1207] Corsicana Daily Sun, Corsicana, Tex., online archive, above, 10 Apr 1963, p. 7, col. 2 (reprinted here with consent of the Corsicana Daily Sun). [S1017] Navarro County, Texas Genealogical and Historical Web Site, online, above.